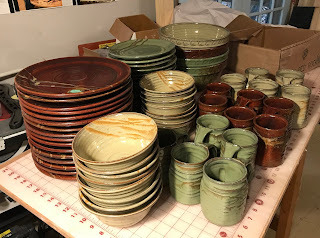 Sixteen placesettings headed for delivery. The customer wanted solid colors so I did each piece of the placeserting a different color of my Autumn pattern, one each of the serving bowls and one complete autumn pattern. The signature turquoise spot is on the red pieces.